Art is taking something ordinary and making it extraordinary. 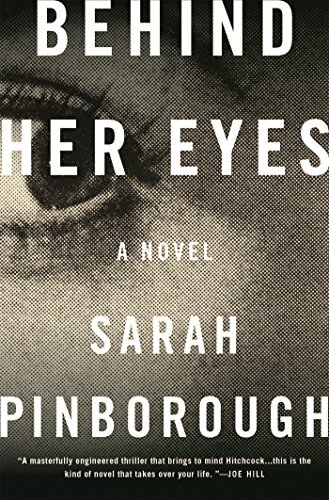 This Sarah Pinborough does with style in Behind Her Eyes, an odd title whose meaning didn’t fall in to place until days after I had read the book. The book opens with multiple secrets: Beautiful Adele, new to town, cleans up broken glass, mud under her fingernails, and “all evidence of earlier rage.” Dinner is ruined. “We’re ruined,” she tells herself, meaning the husband she clings to, David. David has hastily taken on a new job as consultant psychiatrist in a brand new town. He keeps Adele on a regimen of powerful antipsychotics. He calls her at precise times throughout the day to check on her. He locks away private notes. He also controls her formidable inheritance. The third member of this triangle is Louise, a lonely divorcée whose son is gone with his father for the summer. Louise suffers nightmares and sleepwalks. One evening she meets David in a bar. They flirt. She sleeps with him. The next morning she discovers to her horror that he is her new boss at the clinic where she works. It gets more complicated from there on. Louise literally bumps onto Adele on the street. They have coffee. Instantly they become friends. Louise learns later on that Adele is David’s wife, but she hides their friendship from him even as she becomes increasingly drawn in to the couple’s unconventional, bizarre marriage. The book’s chapters are short and repetitively titled “Adele,” “Louise,” or “Then” (but never “David”). Each is told in the first–person voice of either woman or that of a nameless narrator. What seem like incidental matters pay off later and come back into play. Only at the dénouement does a chapter named “After” appear, and another whose title would constitute a spoiler. Adele previously spent months in a mental hospital where she befriended another patient, Rob, a drug addict and dealer. He kept a strange dream diary, and taught Adele the skill of lucid dreaming. On discharge she invited her new “best friend” to her palatial estate in the hope that Rob and David would become friendly, too. They didn’t. Rob disappeared, later presumed dead. Adele’s parents died earlier when part of the estate burned down. David was burned severely while rescuing Adele, “the girl he loved.” But what or who caused the fire? Everyone is a suspect. Adele becomes fanatically possessive (“You know you can never leave me David”). David increasingly tries to control her. Copious quantities of wine are consumed. Louise quaffs wine by the flagon, too. Small wonder everyone’s judgment is iffy. Adele gifts Louise Rob’s dream journal and teaches her lucid dreaming, too, promising it will mitigate her sleepwalking. But once Louise learns to steer her dreams she discovers the “second door,” a portal whose crossing allows her to leave her body. She can float above a scene and observe herself. She can travel distances and spy on others before returning back to her sleeping self. The author is good at foreshadowing, and astral projection is nothing if not a handy plot device. Louise initially mistakes her lucid dreaming for her familiar sleepwalking. But once she cottons on to what is really happening, the action moves swiftly and the consequences multiply. And here is the error in the surprise ending: The author has withheld too much information from the reader so that the ending is equivalent to jumping out from a bush and yelling “surprise!” The great mystery writer P. D. James was adamant that readers be allowed to figure out the truth for themselves. She said authors “should be deceptively cunning but fair” in their planting of clues. It is here that Pinborough disappoints. Nonetheless we have an engaging suspense thriller despite a major gaffe in its ending’s twist. Novel in its concept and construction, this is one unsettling book.